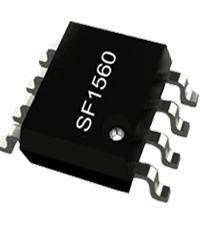 SF1560 is a high performance, highly integrated current mode PWM controller for offline flyback converter applications. In SF1560, the PWM switching is internally trimmed to tight range 。To improve EMI performance，the IC integrates frequency shuffing function to reduce conduction EMI emission of a power supply .the IC also integrates Contant Power Limiting block to achieve constant output power limit from 90VAC to 264VAC . Under light load conditions ,a green mode function can continuously decrease the switching frequency .Under zero-load conditons ,the power supply enters into burst mode and provides excellent efficiency without audio noise generated .This green mode function enables power supplies to meet international power conservation requirernents. SF1560 integrates functions and protections of Under Voltage Lockout (UVLO), VCC Over Voltage Protection (OVP), Cycle-by-cycle Current Limiting (OCP), All Pins Floating Protection, Over Load Protection (OLP), RT Pin Short-to-GND Protection, Gate Clamping, VCC Clamping, Leading Edge Blanking (LEB). In SF1560 ,the OTP and VDD OVP is latch plug-off protection.The other Protection functions are autorecovery mode protection. SF1560 is available in SOP8, DIP-8 packages.